On March 22, 1996, the University dedicated a new addition. 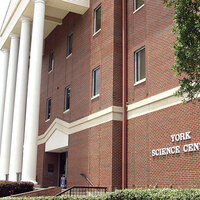 The York Science Center is a three story, 28,000 square foot steel structure with brick veneer designed with six biology and four chemistry laboratories. The facility also provides necessary office space, a lecture hall, Brindley Auditorium (seating capacity of 175), three classrooms and a functional transition area from the new facility to Wells Nursing and Science Hall. The two buildings are conjoined to provide nearly 56,000 square feet classroom and office space. I enjoyed the Movie's intricately developed characters, the scenery was rich and interesting. Also, our discussion after the movie was enlightening. Thanks for the snacks and water too! Amazing story that truly makes you more sensitive to other people's struggles in life. I truly enjoyed it! The film was excellent. I have read similar stories about children and their mothers being separated while the parent tries to make enough money to support her child. This movie depicted that in an excellent way. It was more than great. It touches your heart and makes one appreciate life. This was a great panel. There was a lot of helpful information presented on every possible path, be it finding a career or attending graduate school. It would be nice to see more employers to gain a wider understanding of what specific fields are looking for in candidates and to get a better idea of the opportunities available. I had s wonderful time at this event. The professors were all very nice and informative, and the student panel was great at answering any questions that the underclass men had! I really enjoyed my time in alternative chapel, and was very grateful this is being offered to students that are unable to attend regular chapel. There is a wonderful blend of fun activities, praise, and learning being offered. I felt it was just the right amount of each, and I wasn't wasting my time in attending.